Coalition tells Denham and Zinke: Hands off state water rights & Delta flows! 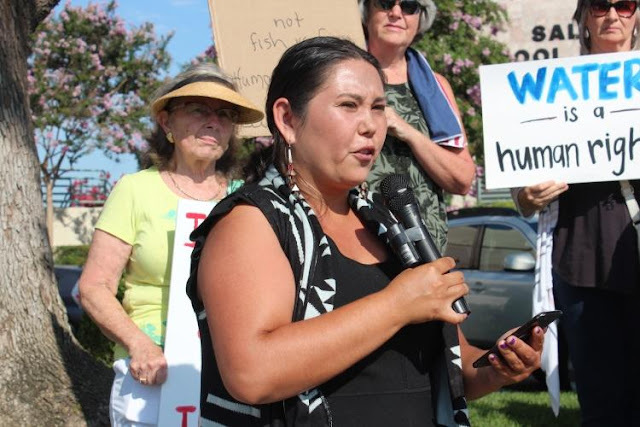 Morning Star Gali, Tribal Water Organizer with Save California Salmon and a member of the Pit River Tribe, described the catastrophic consequences that would result if Denham’s rider and the other two riders get through Congress with backing by the Trump administration. Photo by Dan Bacher. As Congressman Jeff Denham was touring Don Pedro and New Melones reservoirs with Secretary of the Interior Ryan Zinke on July 20, conservation, Tribal and environmental justice advocates held a press conference outside Denham’s Office In Modesto on July 20 to voice their opposition to three poison pill riders to an Interior Spending Bill that threaten to destroy salmon and other West Coast fisheries and eviscerate California water and environmental laws. Speakers at the event included Barbara Barrigan-Parrilla, Executive Director of Restore the Delta; Morning Star Gali, Tribal Water Organizer with Save California Salmon; Sonia Diermayer; Co-Chair of the San Francisco Bay Chapter of the Sierra Club, Ron Stork, Policy Analyst and CA Water expert with Friends of the River; and Kimberly Warmsley, a San Joaquin County environmental justice advocate. The coalition blasted Denham for introducing the latest rider to the Interior, Environment, and Related Agencies Appropriations Act (H.R. 6147)—a bill that has received criticism from Senator Dianne Feinstein, Senator Kamala Harris, and even California Secretary for Natural Resources John Laird, due to riders written by Congressman Ken Calvert (R-Corona) and Congressman David Valadao (R-Hanford) that seek to bypass state and federal law by banning judicial review on the Delta tunnels project, the State Water Project, and the Central Valley Project. On the day before the press conference, the House of Representatives approved HR 6147 with the three riders attached. The package will now go to the U.S. Senate, where a big battle over the controversial riders is expected. Barrigan-Parrilla-Parrilla began the press conference by discussing how Denham’s rider would increase water diversions for farmers in the east end of his district at the expense of those on the west end of his district. “His rider, along with Calvert’s and Valadao’s riders that made it into the House Interior Appropriations bill, are now all tied together in an attempt to circumvent water rights laws and protections for the SF Bay-Delta estuary. These three California Republican Congressional Representatives are attempting to clear the path for the Construction of Governor Jerry Brown’s tunnels (that’s a weird alliance huh, but it’s true – we have the receipts),” she said. “These three congressional reps are trying to circumvent state water rights that will lead to the privatization of water because Delta tunnel proponents are now looking at a public private partnership to pay for the project. Private investors will end up controlling water deliveries throughout the state if the tunnels are built,” noted Barrigan-Parrilla. “And because they are understably upset, Jeff Denham created legislation to harm water rusers in the Delta instead. He is punishing the Delta to please his big ag donors, instead of bringing all waterall water users to the table for a better solution. He is a divider, not a uniter,” she pointed out. “Science tells us that fisheries and the Delta need 50-60% freshwater flows from the San Joaquin Rivers and its tributaries to stop extinction of our fisheries. South Delta farmers and water users need these freshwater flows so that water quality is maintained for crops, Delta environmental justice communities, and all beneficial uses of water under the law,” Barrigan-Parrilla continued. She criticized both the Brown administration’s “poor leadership” on water issues — and Republican Congressmen Denham’s for bringing Zinke to his district to promote his rider. “We have had poor leadership from the Brown Administration on these water issues -- all exacerbated by Brown’s push for the Delta tunnels. The State Water Board is attempting to solve the problem of San Joaquin River flows like King Solomon splitting the baby between water users near Modesto and the Delta. But now, we have Congressman Denham, like his California Congressional colleagues Calvert and Valadao, making the entire situation worse. And to add insult to injury he is bringing the anti-clean water Trump Administration here into the District in an attempt to force the rider into law,” Barrigan-Parrilla-Parrilla stated. “Ryan Zinke needs to go home – and Jeff Denham should keep his hands off Delta flows. Try working on a positive solution instead of robbing everyday Americans for your rich donors,” she concluded. Morning Star Gali, Tribal Water Organizer with Save California Salmon and a member of the Pit River Tribe, described the catastrophic consequences that would result if Denham’s rider and the other two riders get through Congress with backing by the Trump administration. “The Trump Administration’s meddling in California’s state rights threatens our economies, jobs, and livelihoods. It also threatens the rights of native people, whom are the real senior water rights holders, and are leading the effort to restore California’s rivers for all people,” Gali emphasized. “The only that can regulate state waters is the state of California. It’s not OK to get permission from the Bureau of Reclamation to go rogue. The Bureau is not the right agency, not the right one, to be involved on the Stanislaus or other California rivers,” stated Stork. Sonia Diermayer, Co-Chair of the San Francisco Bay Chapter of the Sierra Club. said California's water resources “must be shared equitably among all its people and its natural environment. “We will not stand by and watch as Representative Denham, along with other congressional Republicans and the Trump administration impose federal controls over California water rights and infrastructure that would benefit a few and harm many,” she concluded. Ironically, at the same time the Trump Administration and Congress are teaming up in an attempt to eviscerate state’s rights and destroy the Delta and Central Valley rivers, the Delta Conveyance Finance Authority’s (DCFA) has requested a $1.6 billion loan from the Trump Administration through an Environmental Protection Agency (EPA) program for the construction of Governor Jerry Brown’s Delta Tunnels project. On July 23, a statement from the Delta Counties Coalition described the controversial project as the “State of California’s ill-conceived proposal to build twin tunnels in the Sacramento-San Joaquin River Delta known as ‘WaterFix’”. Opponents say the project to divert Sacramento River from the North Delta by building two massive 35 mile long tunnels would destroy the Sacramento-San Joaquin River Delta ecosystem and West Coast fisheries. “The Metropolitan Water District and other tunnel proponents that make up the DCFA, haven’t even started the project and they are already seeking a federal deal,” said Sacramento County Supervisor and DCC Chair Don Nottoli. Nottoli noted that the U.S. Department of the Interior (DOI), the lead federal agency responsible for the environmental review of California WaterFix, is on record signaling that it does not expect to participate in the funding or construction of the tunnels. “If the JPA gains access to $1.6 billion in financing, it will crowd out funding that could otherwise be used by other California agencies throughout the State. This essentially slams the door on critical projects that, unlike WaterFix, could actually increase the State’s water supply for many California communities,” Nottoli concluded.